It’s April and Earth Day is just around the corner! In honor of this special day please consider donating to Project Food Forest so we can continue planting fruit and nut trees in our city and region. As a thank you to those who donate in the month of April we will send a pdf created by Project Food Forest co-founder, Veronica Shukla. 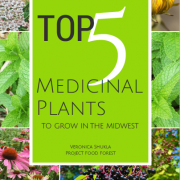 This pdf is chock full of wonderful information on medicinal plants that grow in the Midwest. Read the following excerpt and then click here or the button below to donate! Yarrow is an evergreen perennial plant native to our region, so it is well-adapted to our climate and grows extremely well here. You never have to water or pamper yarrow. In fact, you may have seen this plant come up as a “weed” in your yard. In the wild, yarrow has white flowers, but cultivated versions come in all sorts of colors from pink to red to yellow. Yarrow’s genus name, Achillea, comes from the Greek god Achilles who bled to death, because yarrow’s greatest power is its ability to stop bleeding. Yarrow is astringent, which means it causes cells to constrict, so when you apply yarrow to a wound, the astringency staunches bleeding. But that’s not all! Yarrow is also antibacterial, anti-inflammatory, and antiseptic, making it the ultimate application for wounds. In fact, yarrow was used to pack battle wounds for thousands of years. You can use yarrow in many different ways. When you’re outdoors hiking or working, you can just pick some yarrow leaves, chew them up, and apply it to the wound. You can also use yarrow in homemade salves and ointments, infusions (tea), or tinctures. Drink some tea at the first sign of a cold or apply some tincture on a cotton swab to instantly stop a nosebleed. Apply some tea or an ointment to your face to fight acne, moisturize, and tone pores. 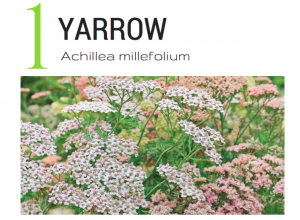 If you don’t have yarrow “weeds” already, yarrow seeds and plants are easy to find at nurseries and seeds suppliers. Seeds need to be cold stratified or planted in fall or winter. Yarrow can be an aggressive plant, but it will never be invasive here, because it is native. It reproduces through seeds and stolons, so you may want to deadhead the flowers to keep it in check. 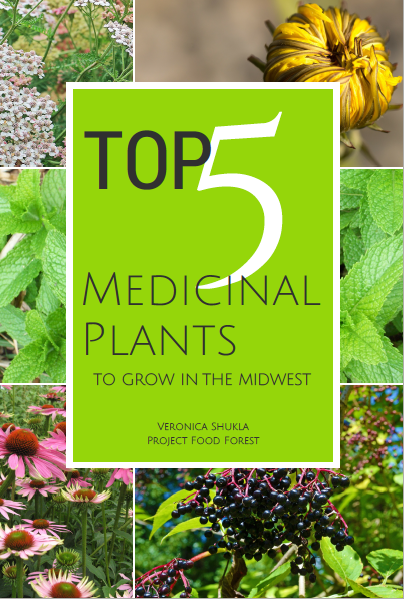 Better yet, harvest the flower buds for their medicinal powers. *Some people are allergic to plants in the daisy family and should avoid using yarrow. This post and pamphlet is meant to be general advice for growing medicinal plants and introductory information about medicinal preparations. We are not offering medical advice and are not attempting to treat or cure any disease. Consult with your health care provider for medical advice regarding health and whether these medicines are appropriate for you. We encourage you to confirm the information on this pamphlet with other reputable sources. Project Food Forest and Veronica Shukla expressly disclaim responsibility, and shall have no liability, for any damages, loss, injury, or liability whatsoever suffered as a result of your reliance on the information contained in this pamphlet.